The Swedish star appeared for his seventh club in Europe’s elite club competition. Ibrahimovic has appeared for the most clubs in the Champions League. ZLATAN IBRAHIMOVIC HAS set a Champions League record after playing for Manchester United against Basel on Wednesday. Jose Mourinho’s men lost 1-0 in Switzerland, but Ibrahimovic nevertheless made history, appearing for his seventh club in Europe’s elite club competition, more than any other player. 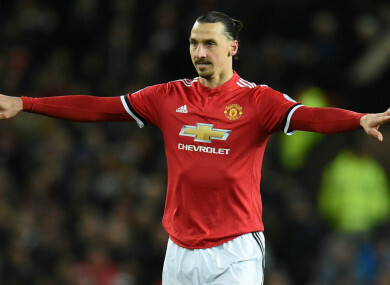 Ibrahimovic has played for Ajax, Juventus, Inter, Barcelona, Milan, PSG and United in the Champions League, though he has never won the trophy. The Swede could not help United to the knockout stages against Basel, as Michael Lang’s 89th-minute goal earned Basel all three points. United remain top of Group A, with 12 points, while Basel and CSKA Moscow are locked level, with nine points each. Basel’s victory, and Lang’s goal, has extended a quite amazing record for the club, with no English side ever managing to keep a clean sheet at St. Jakob-Park, in 14 previous such matches. Email “United may have lost last night but Zlatan made some Champions League history”. Feedback on “United may have lost last night but Zlatan made some Champions League history”.